If there's anything that smells as good as tarts in the oven, it's gonna be quiches. 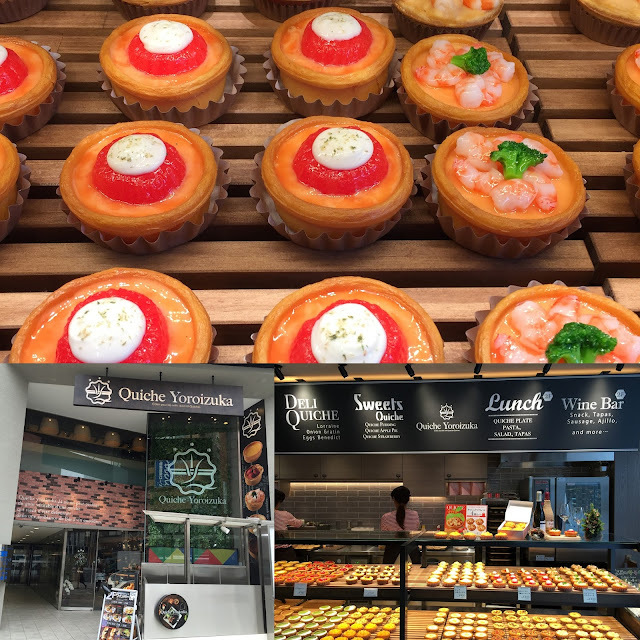 Quiche Yoroizuka is the latest venture by famous Tokyo patissier Toshi Yoroizuka. He has always wanted to open a quiche shop since at the age of 29 years old when he was working at a cake shop. Kitchen meals would always be the quiches sold from a shop in front of the train station and the attractive aroma and flavors unique to a quiche made him dream of his own quiche shop. I guessed it's finally dream come true for Chef Yoroizuka as he has not only opened 2 takeaway outlets in Ikebukuro and Shibuya but also a full bistro cafe on quiches in Aoyama. The menu is divided into two sections: Deli Quiches and Sweets Quiches. The savoury fared better than the sweet quiches mainly because the pastry shell was flakier and its inherently savoury qualities made it a natural partner for the deli fillings. This could also be a reason why savoury quiches are more common than sweet ones. I recommend you to dine-in at the cafe unless you have an oven at home as the quiches can be reheated. This definitely helps to boost the crispness of the quiches as they tend to turn soggy faster than tarts. The Quattro cheese (\380) is a must-try for all cheese lovers as the intensity of the cheese can challenge the supremacy of Pablo's version. Encased in a butter-rich crust, Egg Benedict (\480) did not fail us with its oozy egg yolk and nondescript sauce. On the other hand, the Strawberry Custard was exceedingly sweet but luckily less so for the Matcha.